Before starting First Coast Weddings and Events in 2002, I worked at hotels and country clubs in the catering department. So I know a thing or two about customizing menus and getting the most bang for your food-and-beverage buck. One of the hardest things for brides and grooms is menu pricing. It's hard for our staff too, even though most of us have worked in hotels. So, here are some things to think about when choosing a venue. For the purposes of this post, we'll look at venues that have in-house catering. 1. What is included? Or a better question, what is NOT included? Tax and service charge: Most venues add 18-22% to your food and beverage total, which should be split among the wait staff, bartenders, and other venue personnel. In Florida, a "service charge" is taxable, so be sure to figure that into your calculations! Take your total, add the service charge, take that total, then calculate the tax to get a total amount. Additional fees: Chef fees, bartender fees, and setup fees can add up quickly. Be sure to ask if there are any of these fees in addition to the menu price, and if they are taxable. 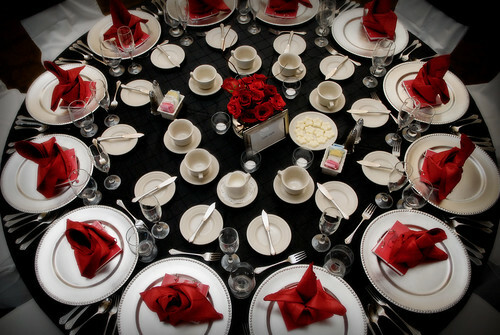 Rentals: Are standard tablecloths included? Are they floor length? Is the dance floor included? Be sure to get it in writing if they are. If a menu has the word "inclusive" after the price, it means that the tax and service charge are already included. Some venues offer package pricing, some offer ala carte. It's hard to compare prices when one includes a 4-hour premium bar and one doesn't. I suggest making a spreadsheet with all possible charges - food, bar, rentals, fees, tax, service charge - to come up with a total amount for each venue. If you have any questions about what a venue charges, be sure to asking the catering manager! Be sure to consider the food and beverage minimum when comparing too. This is the total amount you will need to spend on food and drinks before tax and service charge. This minimum typically does not include other fees, rentals, etc. You can ask for a specific price or a specific item, but not both. For example, you have your heart set on prime rib, but it's not on the venue's menu. Ask! Most chefs are happy to put together a custom menu for you. Likewise, if your budget for hors d'ouevres, sit-down dinner, and 4-hour bar is $100 inclusive (meaning with tax and service charge), you might ask your catering manager to customize a menu for you. You might not be able to serve prime rib, but the chef may come up with an interesting option that will fit your price point. Be sure to negotiate these things before signing a contract, not 6 weeks before your wedding! And remember, you might be able to get a better deal on an off day or a non-peak month, depending on the venue.